Wondering how in the world to stay on track during the holidays and not blow your keto lifestyle? Let The Keto Family help! Get all the best low carb and keto Holiday recipes here for a happy and indulgent celebration! Keto, Low carb, sugar-free recipes – everything the main course, sides, and desserts. I love a good holiday ham. It was a tradition in our house to have sliced ham for Christmas and I look forward to it each year after having turkey for multiple holiday parties. Whether you enjoy this bacon wrapped turkey for Thanksgiving or Christmas or anywhere in between, it will be sure to make your mouth water. After all, everybody loves bacon! Buttery, tender, juicy, flavorful prime rib is a great addition to any holiday meal. Can you tell I am in love with this recipe? Super simple side dish to replace those mashed potatoes. This recipe is so versatile, mix it up and add what you wish. It’s not the holidays without some green bean casserole. There are a few recipes out there but this one just looked so tasty we had to include it in our top picks. This has become a family favorite and I cannot wait to share it with other people at our holiday gatherings. It is so easy and something a bit different than what’s always at the holiday party. Pinwheels or rollups are one of my favorite things to sneak at the holiday dinner party. This recipe could be made in so many ways and is such a cute, tasty, and festive idea to share with friends. You will be lucky if these make it to the holiday party before everyone in the family sneaks them and they are gone before you go! This delicious cheesey holiday appetizer will have you sticking around that buffet table. Use nuts for dipping or create your own keto cracker. Your guests will be drooling over this tasty recipe with broccoli, ham, and three kinds of cheese. This ooey, gooey side is cheesy, creamy, and full of flavor. What are the holidays without mac-n-cheese? With this yummy recipe, you will never miss the old noodle mac-n-cheese loaded with carbs. You will thank us later. A holiday staple, with 🥓BACON🥓! Yes, you heard me right! GO MAKE THEM RIGHT NOW!! Your aunt Edna will thank you. You can’t holiday meal without a biscuit or a roll where I am from, so finding keto/low-carb alternatives is a must. These are delightful and just like Red Lobster’s cheddar biscuits. Don’t forget the keto gravy to smoother all those holiday goodies in. Who wouldn’t want to wake up to these treats during the holidays? Try out these Cinnamon rolls with a caramel pecan topping. So looking forward to surprising the kiddos with these for breakfast on Christmas day! How festive and fun! Pumpkin roll is a staple at my momma’s house for Thanksgiving and Christmas, only momma makes it Southern style. Here’s a keto alternative that looks just as good. 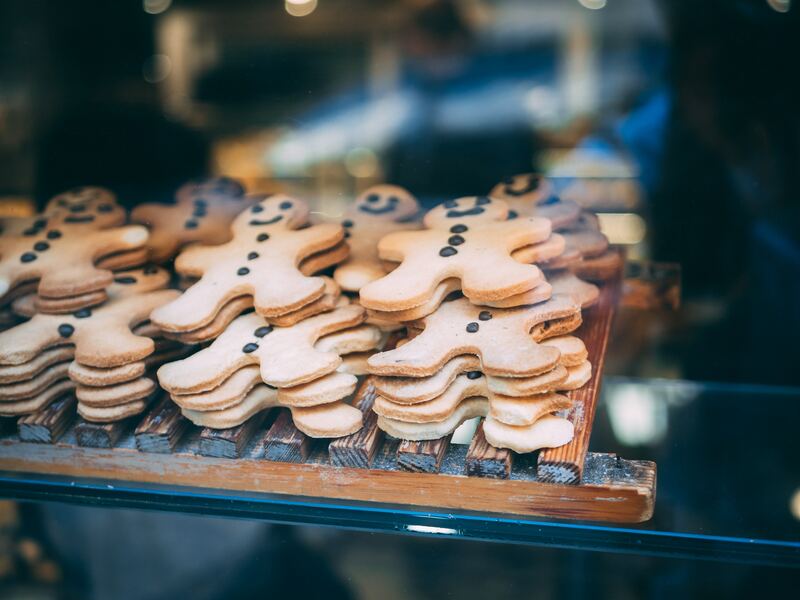 I am pretty excited to find a low-carb GingerBread Man recipe as my kiddos are really looking forward to our holiday tradition of making some and decorating them. There’s something about Snickerdoodles that puts me in the holiday spirit. Even better when they are satiating and low-carb. You can’t have a keto holiday without some cheesecake, whether it is pumpkin flavored or the classic. Alright, our work here is done. If yours is just starting with prepping for the holidays, grab a keto eggnog and a handful of these recipes and get moving! You got this! Happy holidays to you and yours from 🥑🥓The Keto Family🥓🥑. We hope you are blessed with time with family and friends and enjoy everything there is to love about this season. Love getting all the recipes. Thank you all. Thanks so much for the great recipes. With these recipes in my arsenal , I got this!! Absolutely Karen, you are so very welcome. We are here to help!